People on a tight budget can still enjoy having a flower garden. These gardening tips can help save money and the environment while adding some character. Having a beautiful flower garden can be quite expensive, but people do not have to spend a lot of money in order to enjoy eye-catching foliage and blooms each season. People who can wait a bit longer may choose seeds rather than potted plants. Seed packs may be as inexpensive as four to five packs for one dollar at some stores like Dollar General and Dollar Tree and may have an even lower price tag after the season. Purchasing seeds and plants online may cost more, but many of those companies offer coupons, specials, or grab bags that might help people find lower cost options. If seeds are not an option, it helps to know growing seasons and plants associated with holidays in the area. If stores have an overabundance of certain plants after a season or holiday, they usually put those flowers on sale. Some of their less than perfect plants might also have a lower price. It helps to check return policies and save all necessary proofs of purchase, such as the plant, receipt, original packing, etc. just in case that slightly droopy clematis takes a turn for the worse within the guaranteed time frame. Although annual plants tend to cost less, the one-year growing season usually makes a perennial plant a better investment long-term. Properly planning a flower garden can also be a wise investment. Once the plants begin to spread or bloom, a wise gardener may look for ways to enjoy annual flowers the next year. Saving seeds and propagating one’s own plants and flowers can provide a way to garden for less money as well as being environmentally friendly. These can also be shared with others. As gardens mature, they often spread. Many gardeners will readily give away or offer starts of plants at a very reasonable price. Plants may also have a special story to go along with them. Some people have handed down stories with their flowers and plants for many generations, and the history of the plant can give added character to the garden as well as providing a way to share memories. Gardeners who give away bulbs, tubers, plants, seeds, roots, and other flower starts may also offer great tips and do’s and don’ts for gardening. They have often discovered through trial and error what worked well with that particular plant, so it would be wise to ask about any special care needs of the plants. Master gardeners and people who grow flowers as a hobby may welcome interest in their gardens and offer planting tips along with a few flower starts. Some businesses might be willing to give away plants, particularly if the plants need thinning or if they are redesigning their landscape. Social networks go a long way in helping people who have gardening wishes. Mentioning which plants are desired while speaking with others may give people connections to those who can help. Some people may have good results obtaining plants and flowers through social media such as the local newspaper, fliers, or the internet. Be careful if offering information publicly to protect one’s own safety. Some areas offer community flower gardens, where volunteers work together to create nice landscaping for all to enjoy. These may be coupled with a community vegetable garden. Plants for many of these gardens are donated and might offer the opportunity for volunteer involvement as well as shared responsibility in upkeep. Perhaps the flower garden is full of daylilies, but the garden might look especially pretty with some iris. Plant exchanges are offered in many areas of the country. Check guidelines before digging and ensure that the plants are healthy. Unusual and rare plant varieties tend to be more popular than common plants at these exchanges. People who arrive to plant exchanges earlier in the day may have a better selection. Check with the area cooperative extension service, local master gardeners, Chamber of Commerce, or gardening clubs to discover if plant exchanges are offered in the area. Many experienced gardeners started a beautifully landscaped work of art with very little money, a few good garden tools, and a lot of time. Gardeners today can incorporate many of those old-fashioned ways of obtaining flowers and a few new ideas while saving money. 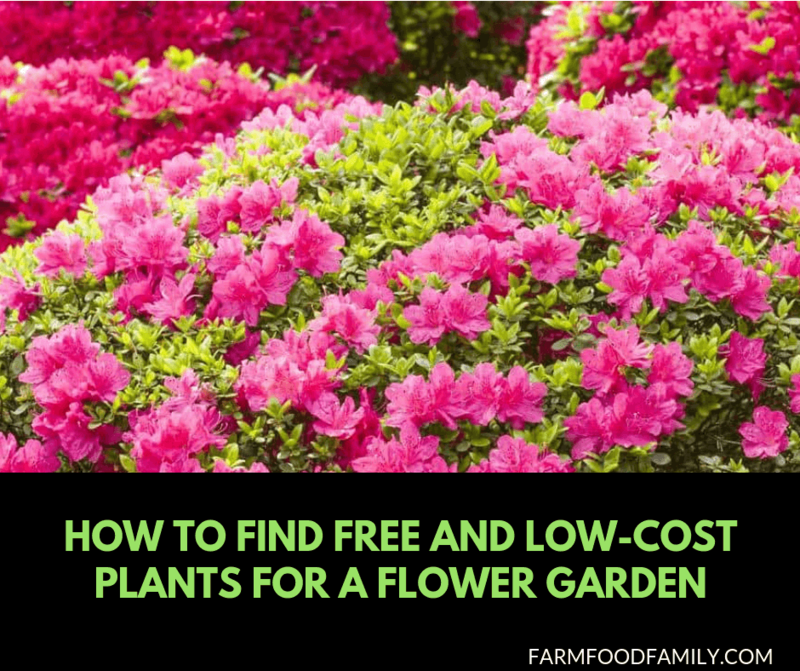 Careful investment in seeds and flowers, checking with friends, family, and social networks, and exchanging plants are just a few ways to have a great flower garden for less. Perhaps some of those plants will come with a wonderful story to be passed down to the next generation.